Business Fives winter season reached a thrilling climax as the Grand Final was held in Glasgow. The best five-a-side teams from all sectors of the Scottish economy who’d qualified through heats in Glasgow, Edinburgh and for the first time Dundee and Aberdeen came together to battle it out at Soccerworld. 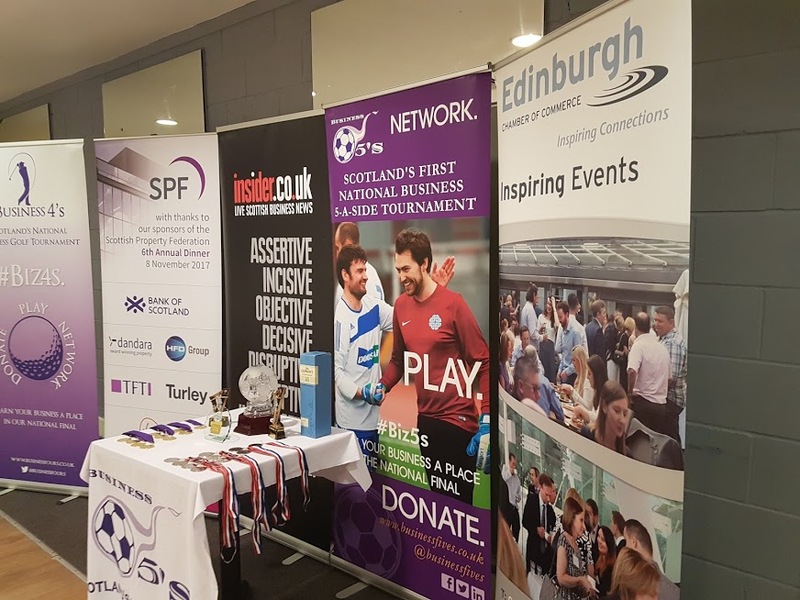 The event, which has been supported by the Edinburgh Chamber of Commerce since it began, reached a milestone when the 4,000th Business Fives goal was scored in the opening fixtures. In total more than 200 were scored on the day as quality football prevailed – and a worthy winner battled through to lift the prize. Ambassadors Gordon Smith and Jim Melrose were on hand for an engaging question and answer session and to hand out the prizes to the winning companies along with Keith Campbell from the Insider. In the group stages it was a free scoring Nairn’s Oatcakes team who topped theirs along with an organised Graham Environmental Services side, who won the Dundee qualifier, triple Edinburgh champs Anderson Strathern and Aberdeen winners Anderson Anderson & Brown. They were joined by Story Contracting, AutoRek and Sky along with MacTaggart & Mickel Homes. The knockout stages saw matches go down to penalties as Sky overcame Nairn, before they lost in another penalty shootout in the semis to Graham Environmental Services. Meanwhile Story Contracting also reached the final with a 2-0 victory over Anderson Anderson & Brown. In the final, Dundee-based Graham Environmental Services ran out 3-2 winners – with a standout performance from Craig McFadden earning him man of the match from Business Fives ambassadors Gordon Smith and Jim Melrose. Meanwhile in the Europa League MacTaggart & Mickel beat Anderson Strathern to get to the final and Nairn’s Oatcakes triumphed over Shepherd & Wedderburn thanks to goals from tournament top scorer Paul Tansey. Tansey then helped Nairn triumph in the final over MacTaggart. Meanwhile the tournament raised a magnificent £9,847 for various charitable causes. Winner Graham Environmental Services received £1,500 which they chose to split between Cash for Kids and Down’s Syndrome Scotland while runners-up Story Contracting got £750 for MacMillan and Europa League finalists Nairn’s Oatcakes and MacTaggart & Mickel split £545 for Edinburgh Children’s Hospital Charity and Cash for Kids respectively. The Edinburgh Children’s Hospital Charity were also the beneficiaries of the charity raffle for a signed Leigh Griffiths Scotland top donated by Nairn’s. The Business Fives events will be back for the summer season and companies can start registering their interest on their website here. Before that the tournament organiser will also host Business Fours, Scotland’s national business golf tournament once again supported by Insider.co.uk. Full details of the qualifying events taking place in April ahead of the final in St Andrews are on their site here.